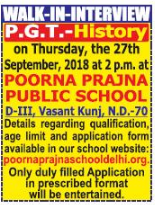 Poorna Prajna Public School, New Delhi has advertised in THE HINDUSTAN TIMES newspaper for recruitment of Teachers PGT jobs vacancies. Interested and eligible job aspirants are requested to walk-in on 27th September 2018. Check out further more details below. A Masters Degree in History with 50% marks, Degree in Education from a recognized university as a regular candidate. Age: Below 36 Years. Relaxable in case of candidates have experience of teaching in Universities. How to Apply: Interested candidates are requested to carry their filled in form (download prescribed format) along with copies of certificates and recent PP size photos to the walk-in address provided below.